Made from the 'Cashmere of Cotton', the exclusive and highly sought-after Sea Island Cotton, these socks are premium from the yarn through to Pantherella's unrivalled hand-finished quality, with a 9 x 1 rib. Genuine West Indian Sea Island cotton is cultivated only in the perfect conditions of the British West Indies and rigorously certified by the WISICA (West Indian Sea Island Cotton Association). This rare and expensive raw material has the longest and finest cotton staple available which gives it its characteristic durability and silky, shiny look. Strong as silk, as soft as cashmere and as durable as wool. Sea Island Cotton for Pantherella socks are sourced and handpicked directly from the West Indies from an accredited source so you can rest assured that your sea island cotton socks are authentic and made from the most luxurious sea island cotton available. 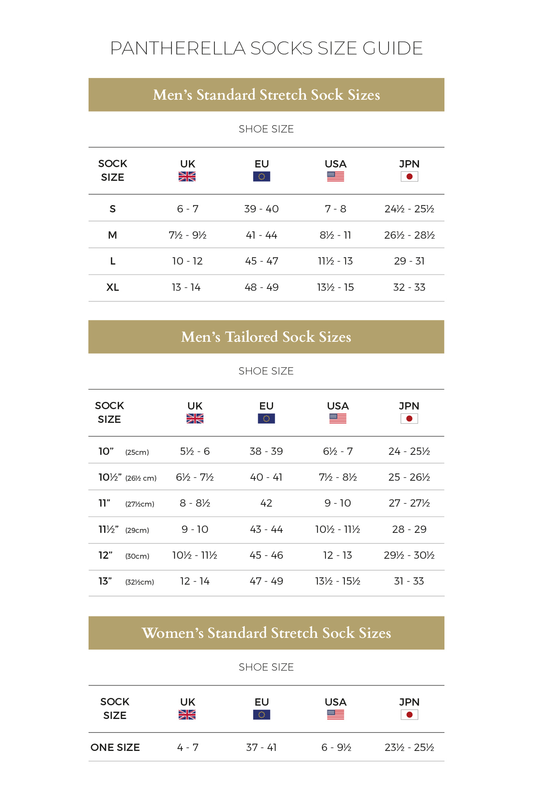 Luxurious and incredibly wearable sea island cotton socks are cool on the skin and incredibly durable making sea island cotton socks a perfect every day sock that your sock drawer is crying out for! Our Sea Island Cotton is grown and processed in the British West Indies and then spun into the highest quality yarn by Spoerry in Switzerland. Our yarn is dyed to a colour palette unique to Pantherella, by the Atkinson Dyeing Company in West Yorkshire. Our Genuine Sea Island Cotton socks have a very cool, soft and smooth feel. They retain colour well and get softer with each wash. The Genuine Sea Island Cotton Pantherella uses has a cotton count of 2/40 NE – this number translates as the thickness and weight of the yarn (2 ply x 40 yards per lb). What is Genuine Sea Island Cotton? Genuine West Indian Sea Island cotton is cultivated only in the perfect conditions of the British West Indies and rigorously certified by the WISICA (West Indian Sea Island Cotton Association). Items made from genuine Sea Island Cotton will carry the WISICA hologram to show authenticity. This rare and expensive raw material has the longest and finest cotton staple available which gives it its characteristic durability and silky, shiny look. It is as strong as silk, as soft as cashmere and as durable as wool.